And how to finally find a solution! Clients experiencing anterior hip pain are common and many present with diagnosis including labral tears, impingement/FAI or chondral issues. It is easy to get distracted by these structural changes, but as with most pathology in the absence of trauma, they are a result of the inefficiency of our movement system. When a client has persistent pain or limited functional tolerances, their healthcare team must consider the health of the related nerves as they relate to the hip structures. That stubborn psoas…. when stretching the psoas is NOT the solution! A clinical conversation about anterior hip pain can’t take place without considering the psoas and how it influences the joint mechanics and thus pain and pathology. 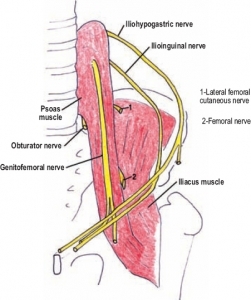 The psoas major originates from vertebraes T-12 to L-5 and nerve roots exit the vertebrae and branches of these nerves come in direct contact with the psoas, including the iliohypogastric, ilioinguinal and genitofemoral nerves. Recurring tightness with objective testing after intervention suggests the muscle itself is not the root cause! Nerve problems, but I don’t have tingling or numbness? When most people hear nerve pain, they immediately think of numbness, tingling, burning, etc. While those symptoms are attributed to nerve dysfunction, they present more commonly at a later or more severe aspect in the cycle of nerve injury. Pain is transmitted and perceived in the brain by the immense network of nerve fibers throughout the tissues of the body. In pain patterns seen as driven by the musculoskeletal system, that leads to missing the entire picture of causative structures that can lead to symptoms. This communication mechanism itself requires a specifically targeted manual assessment of the nerves. Yes, sensory and muscle testing is indicated, yet provides only a very limited picture of potential nerve involvement. Neural tension testing adds to the picture, but is also somewhat global in it’s discernment of an issue. The nerves listed above relate to the hip capsule/ligaments, inguinal canal and lower abdomen, so they deserve a thorough assessment when addressing anterior hip pain. The ability to assess the mobility, firmness, relationships, and local extensibility is crucial in being able to clear the nerves, or in the case of their involvement, adequately treat them to a point of symptom resolution without depending solely on nerve glides. This skill set will be transformative to both clinician and client! Neural assessment and manipulation is a gentle technique, specifically localizing nerves and their course in the body. It is easily tolerated by patients and post-treatment objective testing will provide immediate feedback on the results. Part of a series of posts on nerve entrapments, aka compression, and how they may be the root cause of pain and movement dysfunction.